Nagpur: The National Cancer Institute (NCI) will be opening an OPD along with two Radiation Oncology Centre at its upcoming 500 bed hospital at Jamtha in the month of October . The opening of the new cancer facility brings affordable care to the region.The project which will be undertaken in phases will be complete in 2018. Rs 250-275 crore will be the expenses incurred in setting up of this new facility. The new NCI medical facility will bring the much needed relief to patients ailing from cancer in the regions of Central India, as they won’t have to travel to Mumbai or other metropolises for affordable treatment. The other advantage of this new facility will be that treatment here would cost less than that available at Tata Memorial Centre. University recognized courses in the super-specialty in Oncology, Ph.d programmes, nurses and paramedical training will also be conducted by the NCI here. 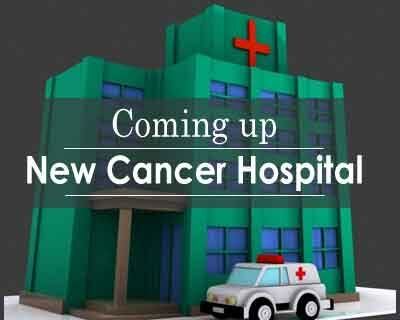 “Most cancer patients in the region are diagnosed late and mostly in incurable stage. This is mainly because a wide gap exists in the options for cancer treatment in Central India. Between Mumbai and Calcutta, there is no major cancer facility. NCI will fill this gap.” said Secretary, Dr Aabaji Thatte Seva Aur Anusandhan Sanstha, Shailesh Joglekar. “NCI’s building with built-up area of 8.78 lakh sq ft will be a green building and we are hopeful to obtain a gold rating. We will also try for a platinum rating and get recognized from Indian Green Building Council,” he added. Being one of the firsts to acquire National Accreditation Board for Hospitals and Healthcare providers (NABH) accreditation along with the Joint Commission International (JCI) recognition, the new facility will also house a residential complex for patient relatives.The residential; complex would be constructed on a 60,000 square feet spread.. According to Joglekar, since many ailing patients cannot meet travelling , treatment and accommodation costs, an integrated palliative care centre was started at Dharampeth in 2012 .This centre benefited 2500 patients across Vidharba and central India. As an integrated part of healthcare this palliative care centre will continue to function as an IPD and merge to become part of the OPD on completion. “Cancer patients have months-long wait list at RST Cancer Institute’s Oncology Radiation Centre. Therefore, the plan is to open two centers along with OPD soon. First, two of four centers will be opened,” informed Jopglekar. This is a very good hospital in all over private hos.Rajiv Gandhi facility are here. I am coming here with my Sasubai for treatment.But one thing is problamatic for poor pationt that all test do with high cost. So I request to u that u should have creat facility for BPL pationt for all high coast test like bone scan , USG . I am a RSS swayamsevak 3rd year shikshit. It\’s been really good for those who needs good and affordable treatment. And also for those who are looking for new opportunities with NCI.